My latest short film is the culmination of over a decade of shooting in the Himalayas and on Mount Everest. 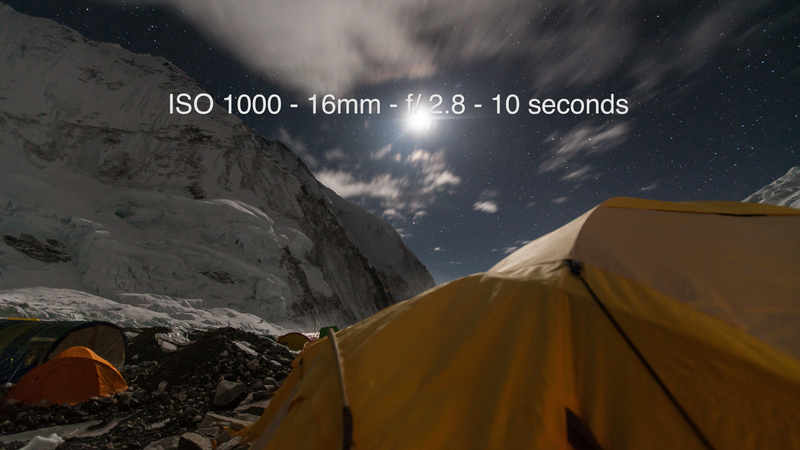 I'm truly humbled to see that my new short, "Everest A Time Lapse Film - II," is captivating audiences around the world. As always, my goal is to bring to life the majestic beauty of the Himalayas, and to inspire others to dream big, discover their passions and explore this beautiful planet we inhabit. 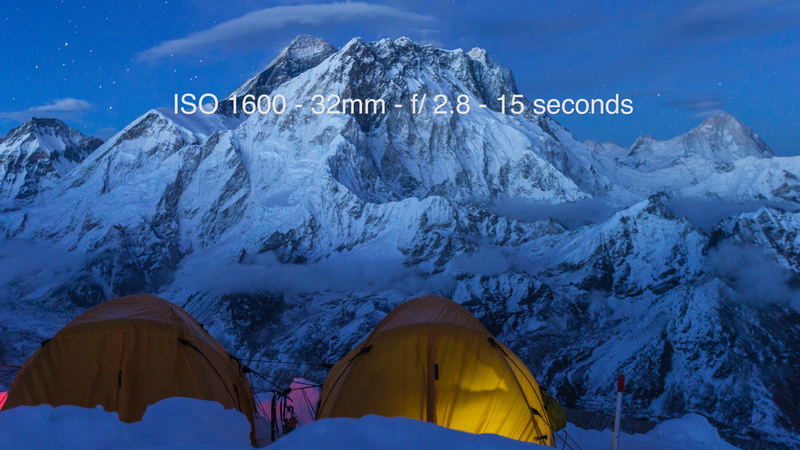 In 2005, I embarked on a journey to Mount Everest base camp as a young aspiring adventure filmmaker. I'd never really traveled, visited a country in the Global South or even slept in a tent. That first journey to Nepal changed everything. My friend Dr. Sean Egan, who was 63 years old at the time and aspiring to become the oldest Canadian to climb to the highest point on Earth, and who also happened to be the subject of the documentary I was shooting, tragically died of heart failure and never made it to the summit of Everest. It was shocking and devastating. In an attempt to honour his life I decided, never having climbed a mountain before, that I was going to climb Everest, carry his ashes to the summit and complete the documentary. Since then, I've returned to Nepal 13 times. I've been on seven Everest expeditions, I've failed twice just 150 metres from the top, survived two avalanches and an earthquake, and stood on top of the world twice, in 2010 and 2013. Every time, with cameras in hand. 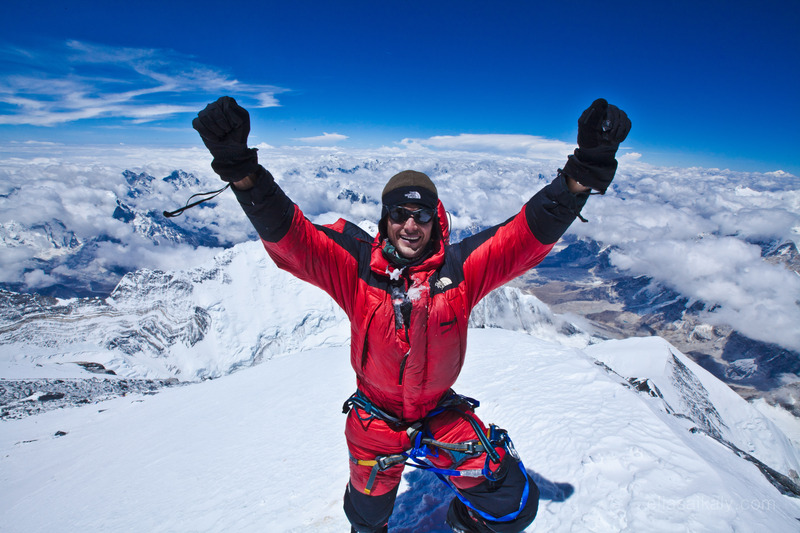 The author at the top of Mount Everest. Perhaps the most meaningful experience of them all was sharing my first summit journey with 20,000 Canadian students who followed the journey virtually, every step of the way, from the safety of their classrooms. 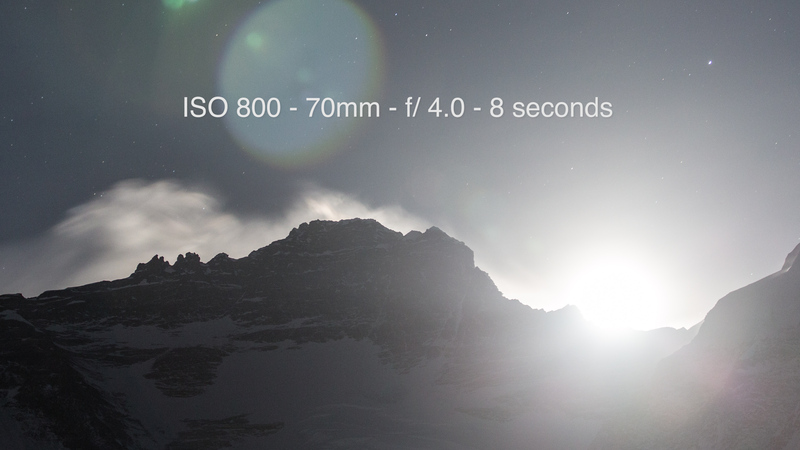 We created a real-time web series, and essentially shot, cut and connected with students in their classrooms via Skype daily, from more than 7,900 metres at Camp 4. In the end, we made it to the summit in person and virtually, Sean's spirit with us. It goes without saying that I've fallen in love with Nepal, her beautiful people and majestic mountains. My latest short film is the culmination of over a decade of shooting in the Himalayas and on Mount Everest. Here are some details on what went into shooting the film, which I'd suggest you watch before reading on. 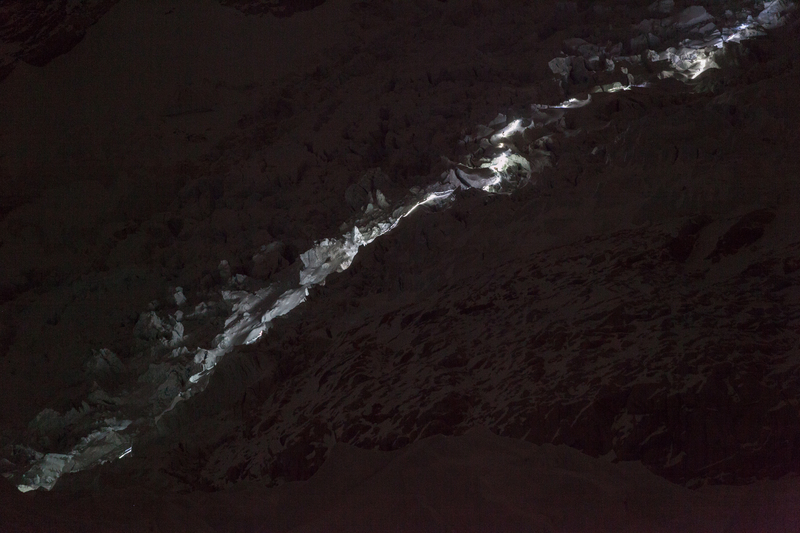 What are those glowing lights we see, and what is the Khumbu Icefall? Climbers making their way through the Khumbu Icefall at night. The Khumbu Icefall is a flowing river of ice that moves at the rate of one metre per day. 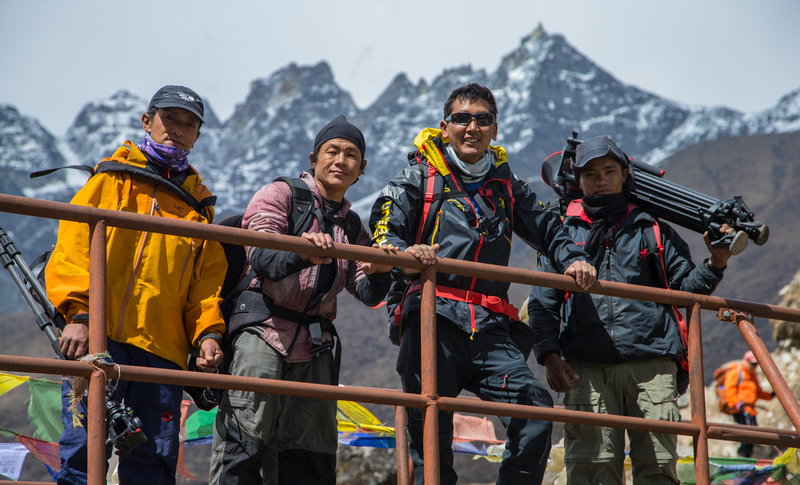 It's deadly, unforgiving and happens to be the gateway to Everest. It's littered with open crevasses that you need to negotiate by crossing suspended ladders that the Sherpas carry and put in place. The glowing lights we see at the foot of Everest in some of the shots are climbers navigating and negotiating the seracs, crevasses and ice cliffs. 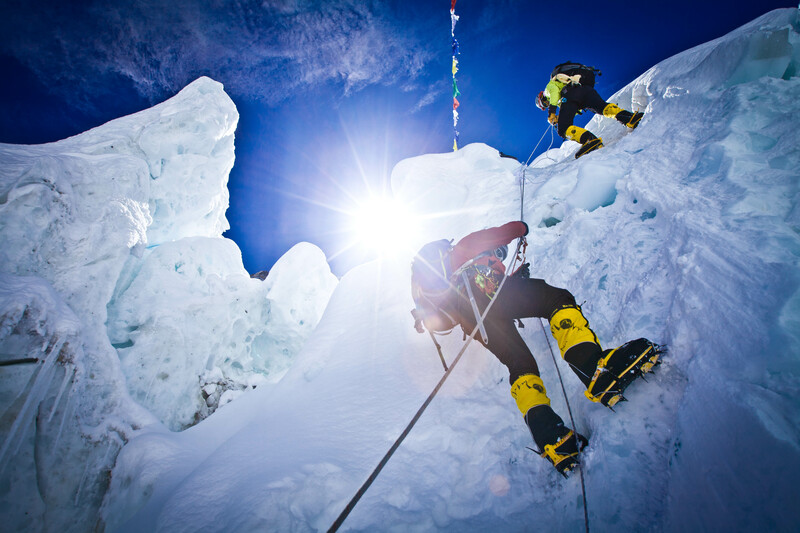 The Icefall is by far the most dangerous obstacle on Mount Everest and you must cross it in order to reach the upper part of the mountain, including Camp 1 and 2. The secondary obstacle worth noting is the fact that we had to summit a 6,000 metre mountain to gain access to some of the shots you see of Everest, both at the beginning and end of the video. This required full expedition gear: ice axes, crampons, ascenders, fixed lines, etc. 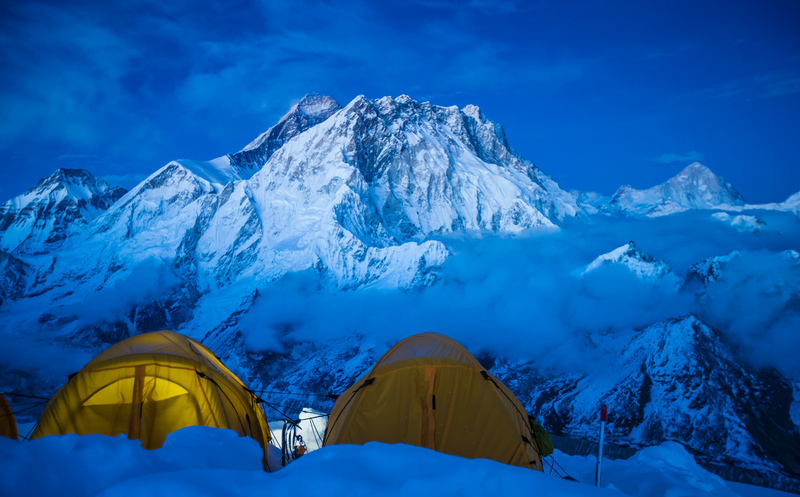 As I wrote in my blog,"We climbed high above the clouds to 6,119m and set up camp for three nights on the summit of Mt Lobuche East waiting for a glimpse of Everest from one of the best 'camp spots' in the Himalayas. We patiently waited for two nights for the skies to break and finally, they did." The altitude has a debilitating effect on the human body, and so it takes a substantial effort on the part of many to establish this camp, carry the gear to the summit and camp out up there long enough to bring back some of these images. We used stoves to melt the snow, and feasted on dehydrated meal packs (think pasta in a bag) and noodle soup. I solely used Canon cameras on this one. Canon Canada was kind enough to lend me some of the equipment below. I use Canon because of their weather sealing, and I happen to be a big fan of the aesthetics. 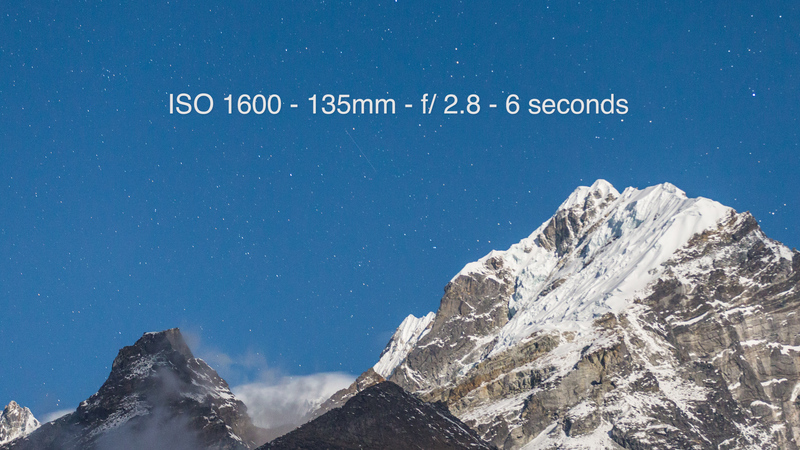 I've been to the summit of Mount Everest twice, and have seen many cameras (and cameramen) fail up there. All of the images were processed on location while at Mount. 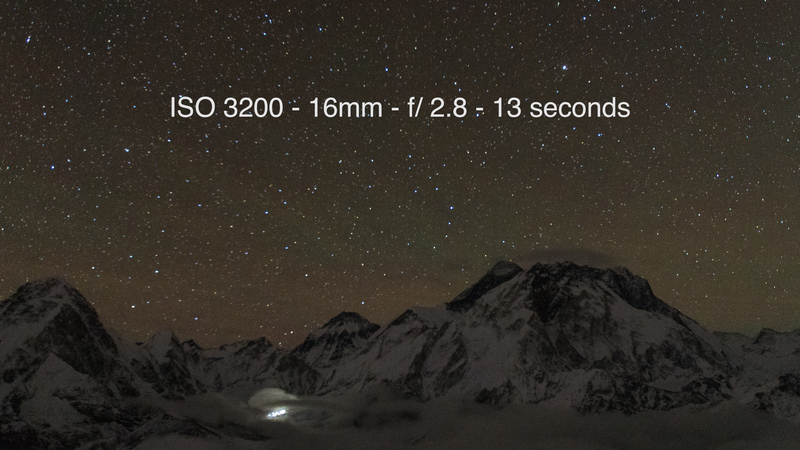 Everest base camp at night, under a headlamp, with a down-jacket on and in -25 C temperatures. That means 82 shots or 42,173 stills on the cutting room floor! Duct tape, hand warmers and hot water bottles. Low tech and affordable. 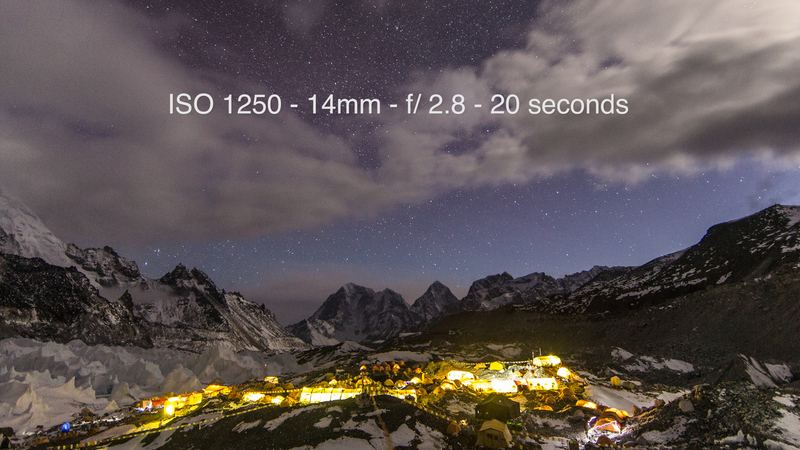 I worked closely with my friend and camera assistant, Pasang Kaji Sherpa, on this project. He was my right hand man in making sure I had what I needed to pull this off. We hired a small team of porters who work with me year after year, men I consider great friends. I've kept these images hidden for almost four years. They were created in 2014 and 2015, seasons that contained the deadliest day in Everest history. Many lost their lives, and I was at ground zero both years. I'm not sure I'll ever forget what I saw in those two seasons, both during and after the avalanches. Somehow, I felt keeping these images hidden showed respect for the fallen. The images at Camp 2 were created right after the 2014 avalanche that claimed the lives of 16 Sherpas. We were trapped above the area where 16 died at Camp 1 and 2, and had to remain in place for three days, unable to assist in the evacuations. 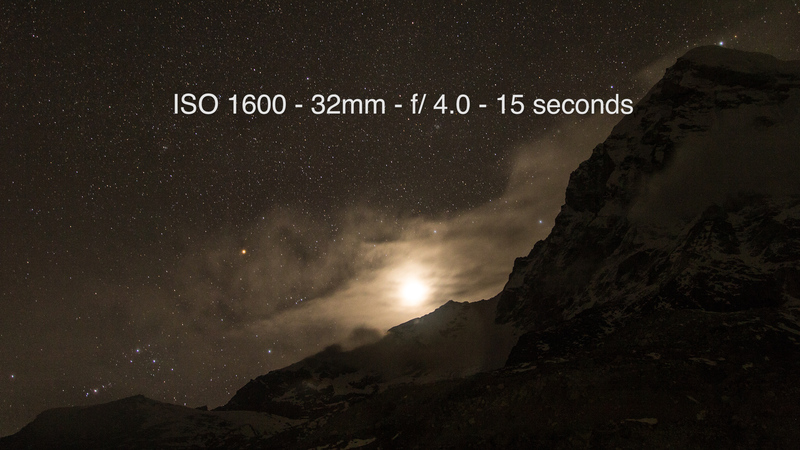 Shooting the night skies eased some of the helplessness we all felt. In 2015, much of what you see in this video was captured days before we got hit by the avalanche at base camp during the Earthquake. No one can ever be prepared for such devastation. It's taken a long time to work through the loss and perhaps, somehow, releasing these images is my way of fully letting go and remembering the beauty, wonder and freedom that comes along with climbing the world's tallest peak. I'd say that the magic of today's technology is that we can all create films like this with very minimal technology. An affordable DSLR or mirrorless camera, a decent lens, an intervelometer and some processing and editing software is all you need. What's also required is the willingness to travel outside of your comfort zone into these kinds of beautiful environments. 13 years ago I had never even slept in a tent and look where I ended up. Who knew! I do what I do because I hope in a small way I inspire you to live your own version of your best life. Your life of adventure, in whatever shape or form it takes. Life on your terms is an extraordinary life. It can be shaped, and it's possible. It often takes a certain level of risk to arrive, but damn is it worth the effort. Shoot for the stars my friends!